The rabbit spirit animal carries many complex meanings. It is associated with fear because of the rabbit’s timid nature, but also with fertility and creativity. The rabbit totem is a symbol of luck in many cultures, and is also a symbol of abundance. 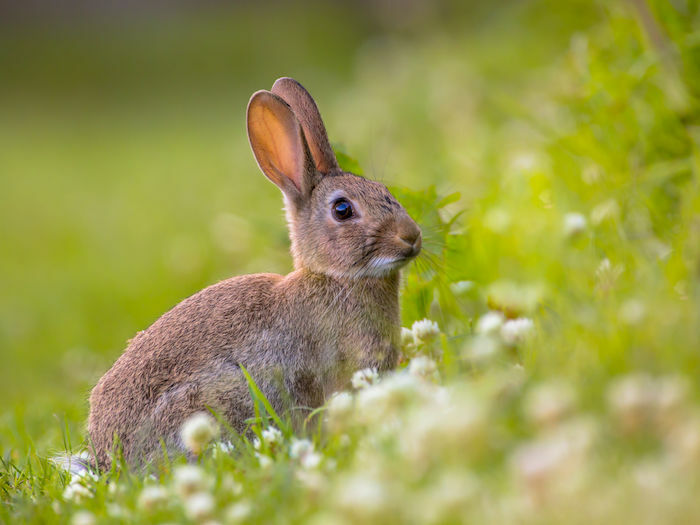 People who feel connected to the rabbit spirit animal are clever and creative, but may be working to overcome fear and anxiety. Everyone has seen a rabbit freeze and then suddenly bolt away as a person walks by. Rabbits are small and gentle, without many defenses. They treat everything as a potential threat, yet are still able to relax as they eat grass or sleep in their safe burrows. People who identify with the rabbit power animal may have a similar timid and fearful response. They may be shy in social situations and suffer from anxiety. The rabbit totem teaches us to overcome irrational fears while still protecting ourselves from harm. Rabbits produce a large number of offspring during their adult years, so they act as a symbol of fertility. They can have anywhere from 2-5 litters a years each producing up to 6 young. If you are wondering if you should have children, seeing this animal totem may be a sign that you are ready. The rabbit totem can also represent a more symbolic fertility of ideas. It may come into your life to encourage you to act on your ideas or plans. Along with their abundant reproduction, rabbits are also known for storing food in their burrows to get them through the long winter months. They usually manage to appear healthy and happy even when snow covers the ground. This has made them into a symbol of wealth and abundance in many cultures. The rabbit totem teaches us to work hard and save in order to make it through lean times. Rabbits rely on their wits and observational skills to avoid danger. One of the rabbit’s defenses is to remain completely still. 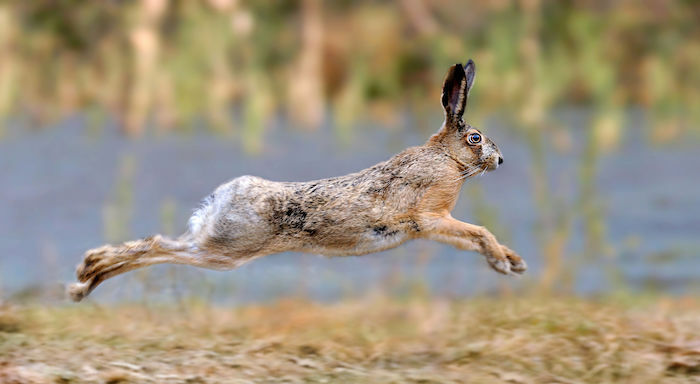 Rabbits know that movement is what most predators detect. Rabbits also make shallow bowls in the ground to hide in with openings in both the front and back to allow for escape. People who identify with the rabbit power animal are often clever and creative, using their intelligence and skill to solve problems that others cannot. If a rabbit appears to you during a difficult time, it may be a signal to think outside the box to find the solution. The rabbit totem can also appear as a reminder to avoid neglecting your creative side. If you have let creative projects lapse, it may be time to pick them back up again or find a new one. Rabbits tend to move in quick, unpredictable ways. They zigzag and dart off suddenly in unexpected directions. The rabbit power animal can be a reminder that a little spontaneity in life is a good thing. It may appear to you if you feel bored or stuck in a rut, reminding you that moving in an unexpected direction may help bring about positive change. If you tend to want to plan and control every detail, the rabbit totem may be a reminder to let go of that occasionally in order to experience things you would miss otherwise. Rabbit symbolism is rich in both myth and folklore. Egyptian hieroglyphics use the symbol of the rabbit in association with the concept of being. In Chinese astrology the rabbit is one of the twelve astrological signs. Greek mythology associated the rabbit with the goddess Hecate. Other cultures including the Algonquin Indians and the Hebrews also have symbolism and meaning associated with the rabbit. In general when rabbit shows up in your dreams, it symbolizes luck, abundance and that good things are multiplying for you. Seeing the rabbit in your dreams is often considered to bring a positive outlook on life. However as with all dream symbols there can be both positive and negative meanings. Rabbit may mean a multiplying of your responsibilities. It can also symbolize hoping from one thing to the next without planning. Finally the rabbit can symbolize both fear and a lack of awareness in creation of your world. Post your ideas and comments about the Rabbit spirit animal by using the comments section below. I was just called to the rabbits today (but I’m also the Year of the Rabit). Thank you for this post! My mom said I’m a small white bunny. I am kind of shy in a social situation cuz..i’ve been alone at school for 2 years. :( Just Joking. I’m a small white bunny.